Since 1889, McCormick and Company, the company behind the Schwartz brand has sourced spices and flavours from around the world, which have become every day staples in our kitchen cupboards and every day essentials to our meals. This year, McCormick are celebrating 125 years of flavour, and they have created an anniversary edition of their signature "Flavour Forecast", which predicts what will drive the future of flavours by analysing the insights and ingredients on the rise globally. McComick have come up with five key Flavour Insights which reflect emerging trends and key cultural influences that are shaping the tastes of tomorrow. Essentially, each one of them tells a story of how people are choosing more diverse and exciting flavours for their cooking, and why. Chillies Obsession: Food lovers everywhere are seeking out their next big chilli thrill. Modern Masala: Indian food is finally having its moment, breaking free of its traditional confines with modern interpretations. Clever Compact Cooking: Proving that big flavours can come from small spaces, cooks in urban kitchens are making the most of what’s available. Mexican World Tour: Mexican flavours are making their way around the globe, with people everywhere discovering new aspects of this bright, casual cuisine. Charmed by Brazil: The world’s attraction to Brazilian cuisine is heating up, thanks to its seductive mix of global and native influences. McCormick challenged bloggers to develop a recipe which will highlight one of the new flavour forecasts for 2014. McCormick are also asking people to "share the story" of their own flavour, and the flavours which have shaped their lives. Almost everything I cook has a story behind it, whether the story is just "I saw it and fancied giving it a go", or whether it has a deeper and more significant meaning. When I read the flavour forecasts, the "Mexican World Tour" jumped out at me as it reminded me about one of my own flavour stories. My father lives in the USA - in Southern California, which is ajoined to Mexico and as a teenager and in my twenties, I spent quite a lot of time there. One of the great things about California is that Mexican food is part of their culture. Being so close to the border, many Mexican people have gravitated over the the USA, bringing their foods and cultures with them and integrating them into everyday society. In the city my Dad lives in, there are countless Mexican restaurants and at least three Mexican fast food takeaways, which is great for me as I absolutely love Mexican food. Being Vegetarian, Mexican food is a great option as most dishes feature veggies, beans and cheese - always a great combination, and then you get to top it off with delicious salsa, sour cream and guac, which adds a burst of flavours to the mix. Whenever I visit California (which sadly hasn't been recently thanks to having kids) I head straight for one of my favourite restaurants - Chilis, which does the most amazing Quesadillas. I always remember visiting as a teenager, and sitting and watching Monday Night Football with my Dad whilst we consumed countless amounts of Quesadillas and Nachos! The UK has some great flavours and cuisines, sadly, Mexican food is not as predominant as other fantastic flavours such as Indian and Chinese cuisine, still I like to cook Mexican food at home to try and recreate some of the delicious flavours I experienced in California. Herbs and spices are commonly associated with main courses and desserts but their flavours are not really associated breakfast very much.In California, I would often grab a breakfast burrito in the morning which was full of delicious spices. Although we are used to our traditional cereal, toast and fry-ups in this country, breakfast burritos also make a great breakfast option. I decided to feature Breakfast Burrito's as my flavour of Mexican Cuisine. 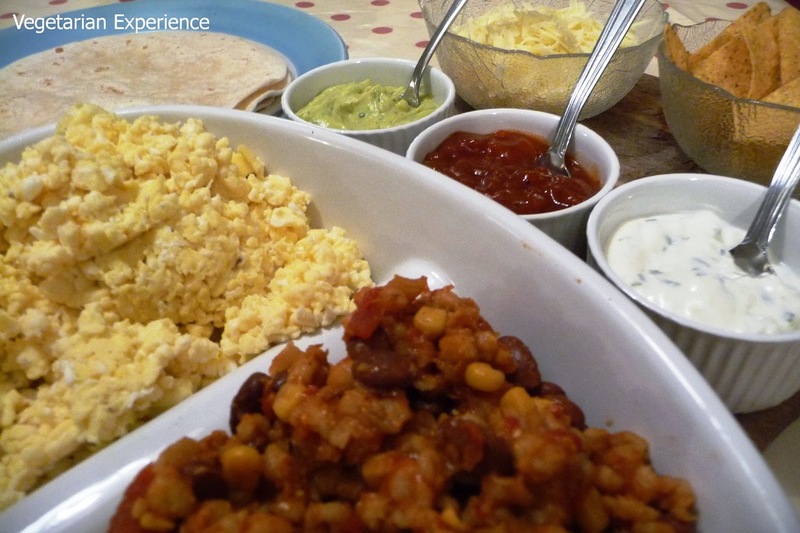 My breakfast burritos feature eggs, vegetables and beans and so they can be a healthy option.You could also make them with lashings of cheese, salsa and sour cream, which make them slightly more calorific. The spices I used in the burritos were onion salt, cayenne chilli pepper, minced galic, cumin and chilli powder. I slow-cooked the bean and vegetable filling, which is great if you don't have a lot of space as it can all go into one pot - I guess that meets the "clever compact cooking" forecast too! By slow cooking the filling, it can be prepared the night before and left to slow-cook, ready for the burritos to be filled the next morning. If you are in a hurry before breakfast, you could grab a burrito on the go by adding the filling, and scrambling some eggs in the microwave quickly, or if you have more time, you could sit and enjoy them with the family with a wide range of toppings. You could also prepare the burritos in advance and freeze them, then thaw and re-heat on the day that you want to eat them. Just like any good muffin needs a hash brown, with my burritos, I decided to make a potato accompaniment in the form of Mexican style Sweet Potatoes. As it's half term this week, we have had more time to sit and eat breakfast together, and we also have time at the weekends to eat at our leisure and so with the potatoes added, it makes for a slightly more filling breakfast. To add spice and flavour to the mexican-style sweet potatoes, I used oregano, onion salt, minced garlic, cumin and chilli powder to add spice and flavour. 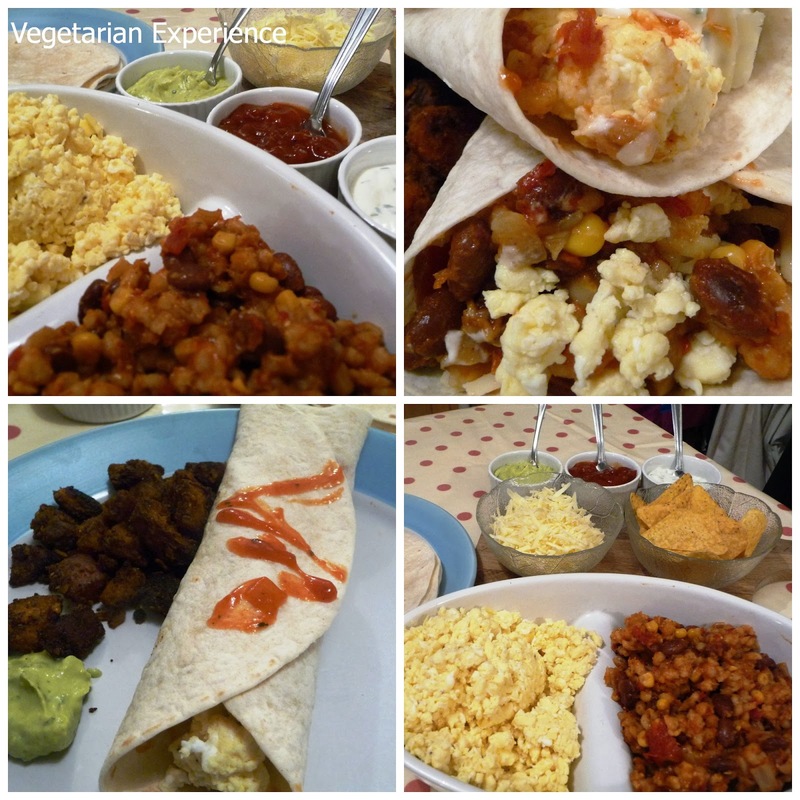 I would thoroughly recommend being a bit more adventurous at breakfast time and giving these breakfast burritos a go, they do make a welcome change from the norm and are packed full of flavour and a punch of spices to give your taste buds a kick in the morning. Schwartz wants you to let them know what tastes and flavours have shaped your life, by telling your own flavour story. To thank you, the company has pledged to donate $1 to United Way Worldwide and it's UK partner Focus on Food, for every story shared on the Schwartz website, Facebook page or other social media channels. You can use the #flavorstory to share your story. 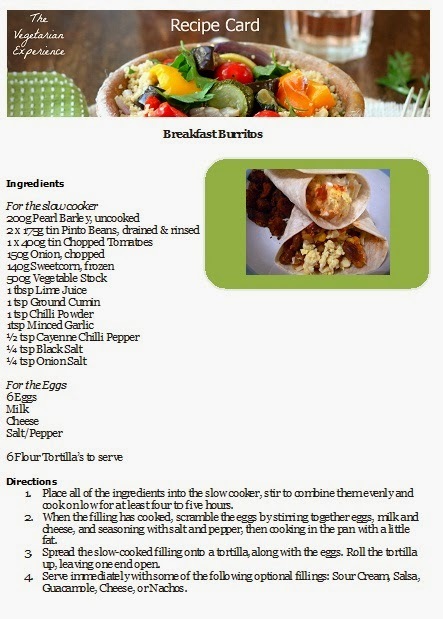 Here is the recipe for Breakfast Burritos served with Mexican style Sweet Potatoes. Do you like Mexican Food? Do you have a flavour story to tell? Disclosure: I received complimentary herbs and spices and a shopping gift card to complete this challenge. Place all of the ingredients into the slow cooker, stir to combine them evenly and cook on low for at least four to five hours. When the filling has cooked, scramble the eggs by stirring together eggs, milk and cheese, and seasoning with salt and pepper, then cooking in the pan with a little fat. Spread the slow-cooked filling onto a tortilla, along with the eggs. Roll the tortilla up, leaving one end open. Serve immediately with some of the following optional fillings: Sour Cream, Salsa, Guacamole, Cheese, or Nachos. Cut the potatoes into 1cm cubed squares. Preheat the oven to 180 centigrade, placing the oven tray in the oven to heat it up. Parboil the potatoes first by placing them in a saucepan and covering with cold water. Bring to the boil and then boil for around 10 minutes. Once parboiled, remove the potatoes from the heat, drain them and then cover them once more with a saucepan lid or plate. Shake them hard for a couple of minutes to make them look a little “distressed” which will help to make them nice and crispy on the outside and soft on the inside. Place the potatoes into a bowl and add all of the seasoning, the tortillas crushed into small pieces, and a good glug of olive oil. 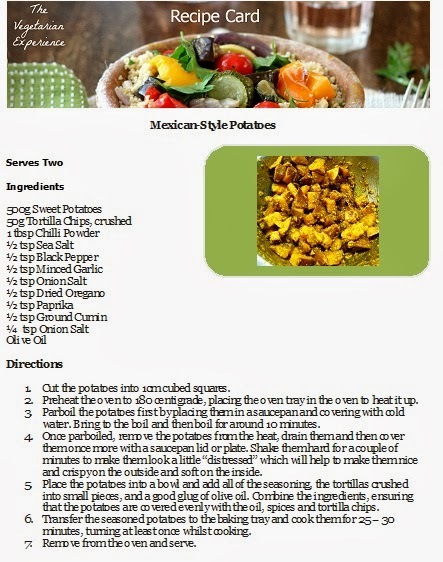 Combine the ingredients, ensuring that the potatoes are covered evenly with the oil, spices and tortilla chips. Transfer the seasoned potatoes to the baking tray and cook them for 25 – 30 minutes, turning at least once whilst cooking.